The wheel (PDF) employs a method used in Formula 1 race cars known has Kinetic Energy Recovery System (KERS). Normally when a car brakes, energy is created in the form of heat on the rotors and pads. In vehicles with KERS, that energy is captured and reused by the motor during acceleration. The Copenhagen Wheel works on the same principal. Energy from the braking is captured an electric motor, which generates a current that is stored on a battery. Later, when the rider is going uphill or needs extra speed, she can tap into that stored energy. And when you attach your smart phone, the bike can be even more helpful. It has sensors and a Bluetooth connection that links to the user's iPhone. The sensors monitor the bicycle's speed, direction and distance and provides information about traffic and pollution levels. As you're riding, you can even collect Green Miles that you can redeem later. They're basically like Frequent Flyer Miles, but you get them for riding your bike around town. The Copenhagen Wheel is part of the James Dyson Award Competition, whose website describes the competition as "an international design award that celebrates, encourages and inspires the next generation of design engineers." The competition is run by the James Dyson Foundation, James Dyson’s charitable trust. Dyon is the guy who found a way to get people to pay more than $500 for premium designer vacuums. The team of MIT students, lead by Christine Outram, opted to name their creation after the very bike-friendly city of Copenhagen. That says a lot about the depressing state of affairs of bicycling in America, where less than a half percent of people get to work each day by bike, according to the 2000 U.S. Census. The next round of the competition is on Aug. 24, when it will name the Dyson Shortlist. 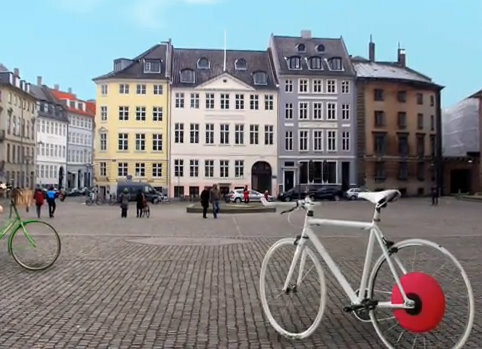 If the Copenhagen Wheel makes it through that round, the International finalist will be announced on Oct. 5.